On Sunday December 15th we hosted a lunch reunion with many of the families that we've been working with since the storm. The event was a tremendous success giving, the families the opportunity to meet with the members of the organization who have worked so hard to help them rebuild their lives. It also offered the SI Sandy Relief Fund an opportunity to recognize the efforts of those members of the organization that have given so much of their time to help those in need. Our organization continues to provide help to those families impacted by the storm consistent with the foundations and beliefs upon which it was started. Below is a slideshow that was shown during yesterday's luncheon and some pictures from this fantastic event. Enjoy! When Hurricane Sandy invaded our house and 10 feet of water destroyed our first and second floors, our family was devastated with losing our safe haven and all of our belongings. Shortly after we reached out to various government agencies that promised to help victims of Sandy, but our entire plea fell short; we had encountered overwhelming red tape everywhere that left us more depressed and disappointed. Luckily, we had met our angels from “SI Sandy Relief Fund” that gave us moral and financial support, and most of all gave us hope, allowing us to believe again that we are not alone, we are not forgotten, that people still care, and are willing to help. After so much struggle and hardship we had endured for the past four months, with the financial help from this foundation, we were able to begin to re-build and are starting to put our lives back together piece by piece, “one nail at a time.” Thanks to these angels from “SI Sandy Relief Fund” we were able to warm up our house by re-building walls, floors, stairs, doors; all the essentials of the house that Sandy washed away. With the help of this foundation our house is beginning to look like HOME again; just a “Thank You,” is simply not enough to tell people that GAVE us what other’s JUST PROMISSED. It has been a long and painful road to recovery; it continues to be a daily challenge with so much physical, emotional, and financial struggle, yet at the end of the day when we walk through the front door and see construction, we are simply delighted and feel so lucky to have the support of this amazing foundation that allowed us to have that glimpse of happiness, to be back HOME. Our family is forever grateful for all your help and support in our most devastating times. We want to express how truly honored we feel to have met such wonderful people. Through this ordeal we have felt so alone and forgotten, Your fund has reached out to us and truly touched our hearts. We met on Christmas Eve and we received such a generous gift tickets to the Knicks game and gifts for our children. We had a great time at the Knicks game, at such a down time in our life this was such an uplifting experience that words can never explain. A couple of weeks ago Ian called to check in and see how we were making out. We explained to him that we moved home but we are living with the house in shambles. We have been trying to repair our home but it is a very slow and tedious process. We have been without a kitchen and the essential elements to lead a normal life. When I expressed this to Ian without hesitation Ian and the fund once again came to our rescue, his words to me were and I quote "we want you to be able to at least cook for your family we would like to get you your appliances" I was so taken back from this, that my husband and I were brought to tears. Carolyn called me the next day and within 3 days we had the most beautiful appliances I could ever hope for. We now have a dishwasher, a stove and a refrigerator thanks to the generosity of the fund. We are so very blessed to have met you!!! Carolyn and Ian have really made me feel so comfortable they reach out to us and they make us know we are not alone. It is very hard to ask for things when you are not used to doing so. With our whole house destroyed this has been a very trying time for our family and thanks to the Sandy Fund we are able to make progress and regain some normalcy in our life. We still have a way to go but thanks to the Sandy Fund, Ian and Carolyn we are on our way. Please forward this to the Sandy fund for me...thank you! We wanted you to be the first to know that as of this weekend, we are officially moving back home!! There are so many emotions that we have moving home, but fortunately excitement is something we are all feeling!!! It was important to us to let you be the first people we let know about the move, since you were instrumental to our financial and emotional well being. We would not be where we are today, if it was not for your help, concern, and assistance. The truck was a lifesaver! It was the first step to resuming normalcy. The appliances, was an overwhelming gift. We would not be moving back home at this time,if it wasn't for your help. I can't find the words to express how blessed we are to have met such an amazing group of people. Meeting each one of you, has touched my life, and I will never forget your kindness. What stands out for me, is the Christmas visit to my family with gifts and the "surprise" Knicks tickets!!! It meant so much that you truly cared about bringing joy to my children for Christmas. The Knicks game, brought a lightness to us!!! It was great to enjoy a day out with no thoughts of the house, the work, the crazy schedules!!! My kids will always remember that day and for that I will always be grateful! Through all the evil of Sandy, there has been losses that will never be recovered, but we gained so much since Sandy.... We have met people who have given so much of themselves, strangers, who have changed our lives. We were forced into a position to ask for help - something that we were not used to. We awkwardly had to learn to accept help, gifts, and financial assistance, which was very humbling. So many, many, people gave of themselves that the only way I can repay all the gratitude we received, is to vow to you, that we will "pay it forward" to others who will need help, in the future. I hope that someday we can help others the way we have been helped. Thank you from the bottom of our hearts! I will be sending you photos of our home, as we begin to put our lives back together. We will never forget the sadness that Sandy brought to our family, but....we will never forget the love and friendship you have given us!!!! Once again, I am writing to thank the Sandy Relief Fund for the generous donation to my family. I have a hard time putting into words how much you have changed our lives. After Super Storm Sandy, our entire lives were in disarray. My family was literally torn away from the normal existence that we lived in happily. We were displaced for months, and my monthly living expenses were rising. This foundation and Sue had the heart and the generosity to lift some of that burden with an donated automobile, thankfully to take the place of a rental that was stretching my pockets weekly. Time passed and eventually we were able to return to our repaired home. After returning, another blow to my family. My living and dining furniture were also causalities. Along with a lot of my necessary appliances. None were salvageable. Again, i was still in a financial crisis, and knew I did not have the funds to replace these things any time soon. And then, my Angel of Sandy was there to help. Sue asked me what I needed, and told me she wanted to help. My children and I now have beautiful couches to lay our weary heads, and a dining set for us to enjoy meals, and share the days happenings together. The Sandy Relief fund also purchased a Washer and Dryer for me and had it installed... now only if they will come to do my laundry :). I espesially wanted to thank Sue for her time ...she took time out of her own busy life to take me shopping for furniture. Although there is some work to do my house looks better then it ever did thanks to this fund. , I feel extremely lucky to have been part of this . This is like a dream come true. And the best part is that the Sandy releif fund was started by regular people with huge hearts!!! The thought that there are people out there that are ready to help and to give not just mine, but any family who has suffered this tragedy, makes me eternally optimistic about my future and the future of my children. A million thanks isn't nearly enough but I will start with that. The McKeon and the Cammarata families along with members of the SI Sandy Relief Fund had a great day at Madison Square Garden for the Knicks game. The suite was provided by the great folks at Guggenheim Partners. The Knicks prevailed and beat the Hornets 100-87 with Carmelo Anthony scoring 27 points in the win. The families were given a well deserved break since suffering immeasurable losses during Hurricane Sandy. Their spirits were high as they enjoyed the game and they are well on the way to rebuilding their homes and their lives. A great day was had by all. Thanks to the Guggenheim Partners for everything!!! Below is an email that Sue from the SI Sandy Relief received recently from Michelle Lombardo, the mother of one of the families we have been helping. "I would like to take the time to acknowledge The SI Sandy Relief Fund especially Sue ,Brad and Nadine Vaiana for the donation to my family. Words can barely express the gratitude I have for you all. Hurricane Sandy ripped mine and my children's life apart, both physically and emotionally. We have lost mementos, that can never be replaced. We have lost costly essentials, most we cannot afford to replace. My children have been displaced from their home, their beds, toys, pets and their familiar surroundings. It has taken quite a toll on us, and we try to see a silver lining through it all. It is very difficult to do most days. The generosity of people through all of this has been quite overwhelming to say the least. One major expense weekly for us was a rental car. This was a necessity in order to travel back and forth to Oakwood Beach, our home, from our temporary housing at the Hotel. My son attends school there and I didn't want to disrupt his daily life any more than it has been. I also needed to check on my pets daily who are staying with my Father who lives three doors down from me and also lost due to Sandy , keep on top of my home repair, etc. To be quite honest, my family would not have been able to afford the rental car for much longer nor would I have been able to purchase another vehicle since I am still making payments on the truck that I watched float down my block. When I received word from Sue that her Brother in law Brad, a stranger to me, was so moved by my situation that he wanted to give us his car I honestly could not believe it, I have little words. Nothing like this has ever happened to me in my whole life. Not only was the car a generous donation and great help it also helped enlighten and lift our spirits about life in general. The fact that this foundation and Brad wanted to relieve me of such a monetary burden brought me to tears. The days after Sandy were probably the darkest of our lives. But this gift has brought back some light. I know there are good and kind people out there now. And although I may never be able to do the same for another person, I will pay it forward somehow, in any way I can. It has been along three months since Sandy walked into our lives… and even though my family lost so much I truly believe I have also gained so much from seeing the kind hearts of many people especially the The SI Sandy Relief Fund. I can’t even begin to express how thankful I am. Love Always, Michelle"
Some members of the SI Sandy Relief Fund visited families and delivered presents to the children on Christmas Eve. Ava Opper, a 7 year old girl from Ridgewood, NJ made and sold friendship bracelets to local friends and donated 100% of the profits she earned ($76 bucks) to the families of @SandyFundSI . 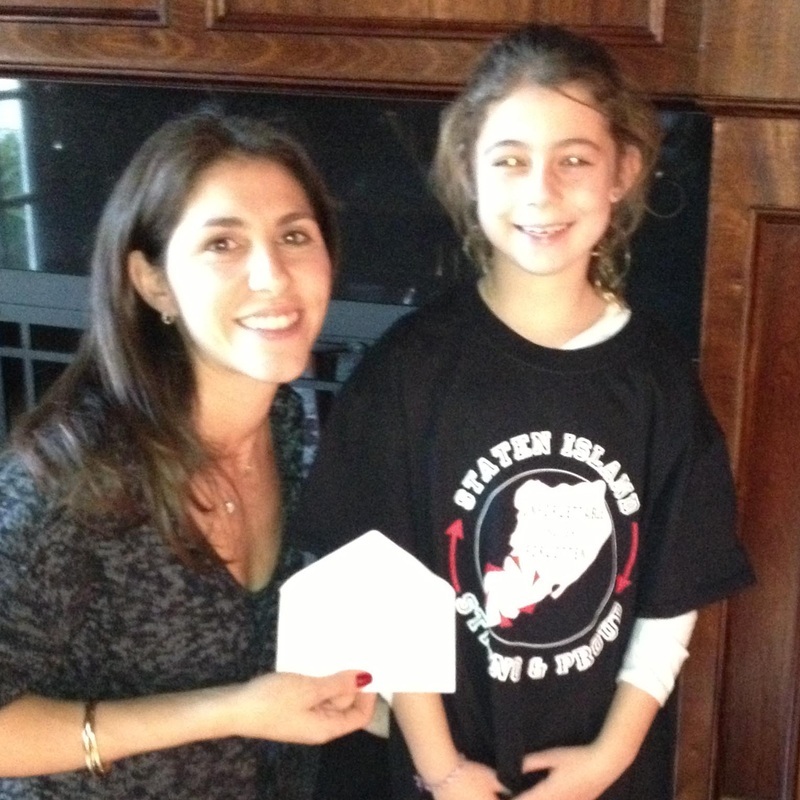 Ava is pictured above with Nadine, a member of @SandyFundSI. 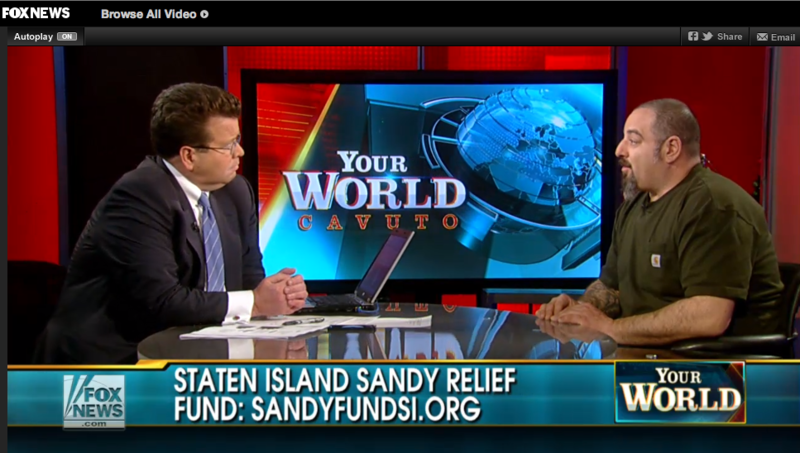 VIDEO -- SI Sandy Relief Fund mentioned on Fox News channel Your World with Neil Cavuto on 12/21 -- See Anthony Marotto discuss the situation he and his wife Keri and their family are facing post Hurricane Sandy and how together we are helping to make a difference! !